Gurudwara Panja Sahib, Hasan Abdal, Rawalpindi : Some 45 km from Rawalpindi on the main G.T road is the Attock District in which Hasan Abdal is a small flourishing town. Hasan Abdal's running waters and springs have always helped it stay as a cultural nucleus in a populous region. The Gurudwara of Panja Sahib at Hasan Abdal is the famous Sikh pilgrimage center and Sikh pilgrims from all over the world flocked here every year in the month of April for the Baisakhi Festival. The temple situated in the center of the town depicts typical Sikh architecture and stands in the middle of a large stone water tank beside the huge stone with the large hand print of Guru Nanak. The Dera had a specific significance for giving boon to the man of the faith and punishing the non-believers. Guru Nanak along with Bhai Mardana reached Hasan Abdal in Baisakh Samwat 1578 B.K. corresponding to 1521 A.D. in the summer season. Under a shady cool tree, Guru Nanak and Bhai Mardana started reciting Kirtan, the devotees gathered together which annoyed Wali Qandhari but he was helpless. According to a legend, Bhai Mardana was sent three times to Wali Qandhari so that the former might quench his thirst. Wali Qandhari refused and even used harsh words for him. Despite all of this, Mardana still very politely stuck to his demand. The Wali ironically remarked : Why don't you ask your Master whom you serve? Mardana reached the holy presence of Guru in a miserable state and qouthed. "Oh lord ! I prefer to death to thirst but will not approach the Wali, the egoist." The true Lord said smilingly," Oh Bhai Mardana ! Repeat the Name of God, the Almighty; and drink the water to your heart's content." The Guru put aside a big piece of stone lying nearby, Where a pure fountain of water sprang up and began to flow endlessly. Bhai Mardana quenched his thirst and felt grateful to the Creater. On the other hand, the fountain of Wali Qandhari got dried up like vanishing of comforts and conveniences of an unfortunate fellow. On witnessing the wondrous act, the Wali in rage, threw a part of a mountain towards the Guru from the top of the hill. The true Lord halted the hurled stone with his hand. An indelibe mark of Guru's hand was inserted in the stone. Observing that miracle, the ego of Wali vanished and he became the Guru's fast devotee. Several attempts were made to deface the impression of the hand of the Guru but all of non avial and the mark remained for ever and ever. This holy and revered place is now known as Panja Sahib. Gurudwara Dera Sahib Panjvin Patshahi - Shrine of Guru Arjan Dev (1563- 1606 A.D) Lahore : Gurudwara Dera Sahib is situated opposite Lahore Fort near Badshahi Mosque. This is the place where Sat Gur Arjun Dev Ji was martyred in the River Ravi facing the tortures inflicted by Chandu on 30th May 1606 AD. The Gurudwara was built by Maharaja Ranjit Singh in the memory of Guru Arjan Dev, the fifth Sikh Guru who complied the Adi Granth, the principal part of Sikh scriptures. This shrine has a highly gilded attractive dome. The followers of Guru Arjan Singh assert that it is the same spot where Guru Arjan Dev miraculously disappeared in 1606 A.D. in the waters of river Ravi. The site where Guru Arjun Dev was martyred a Thara (platform) Sahib was built at by Guru Hargobind Ji in Samvat 1919 when he came to Lahore visiting Gur Asthans. Gurudwara Sri Nankana Sahib Ji - (Gurudwara Birth Place of Sri Guru Nanak Dev ji) : Nankana Sahib is a holy place where the founder of Sikh religion, the dispeller of darkness, the most enlightened global Guru, Guru Nanak Dev ji was born early in the morning to Mata Tripta Ji and Mehta Kalu Ji on 15th April, 1469 (Baisakh sudi 3, Samwat 1526). The township of Nankana Sahib was earlier known as Raipur and later on as Rai-Bhoi-di-Talwandi but after the birth of Guru Nanak, it began to be known as Nankian Sahib/Nankana Sahib. It is situated at a distance 48 miles on the west from Lahore. Guru Nanak dev ji passed his whole childhood and young age in Nankana Sahib. After this partition, a mention of Nankana Sahib Gurudwara in the daily ardasa or prayer has become a regular feature. These Sikh shrines in Pakistan are managed by a Waqf Board and every year, Sikh Jathas visit these shrines on four different occasions. At present there are 25-30 Sikh families residing in Nankana Sahib and as a result of this, daily service is performed and bani is recited. At the occassion of Guru Nanak's anniversary, about three thousand Sikh devotees from India visit Nankana Sahib. Sikhs from all over the world come there too. ***** There are around 150 Historical & important Gurudwaras in Pakistan. 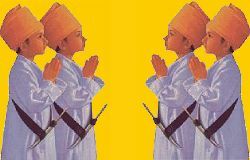 * Sikh history originates from Nankana Sahib. Guru Nanak Dev, the founder of Sikh faith, was born here in 1469. * Gurudwara Dehra Sahib is the place where Guru Arjun Dev Ji, after enduring the most unheard and unseen tortures, without repining, merged into the eternal light on 30th May,1606. * Gurudawara Panja Sahib has an indelibe mark of Guru's hand (Panja) inserted in a stone, which was thrown by the Wali in rage as , towards the Guru from the top of the hill. The true Lord halted the hurled stone with his hand. The Wali was angry as Guru Ji had put aside a big piece of stone lying nearby, Where a pure fountain of water sprang up and began to flow endlessly which gave water to the thirsty & needy. * Gurudwara Tambu Sahib is establised at the place of a large van tree whose branches touched the ground making it look like a tent (tamhu in Purijabi). Once Guru Nanak's father, Mahita Kalo, gave him some money and sent him to Chuharkana, a market town, to purchase merchandise. But the Guru spent all the money in feeding a band of ascetics and came back fully satisfied with what he had done. Once he realised the possibility of his father's displeasure and rebuke. Hesitant to face his father's ire, he hid himself under this tree. * Guru Nanak was sent by Mehta Kalu with some money to teach him the know-how of the business. On the way to his destination, the Guru happened to meet certain sadhus who seemed to be hungry. The Guru responded well to the occasion and got prepared a langer for the sadhus. The place is know as Gurudwara Sachcha Sauda Chuharkana. * By the partition of the Indian sub-continent, the Sikhs not only lost many lives, wealth etc. but also their most loved and revered shrines which went to the other side of the border. After this partition, a mention of Nankana Sahib Gurudwara in the daily ardas or prayer has become a regular feature.